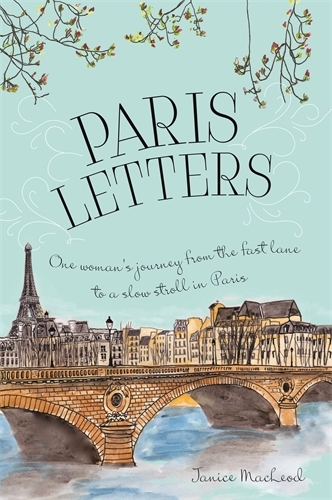 I’m thrilled to welcome Janice MacLeod to the blog today, the author of the memoir PARIS LETTERS which I read and loved recently. 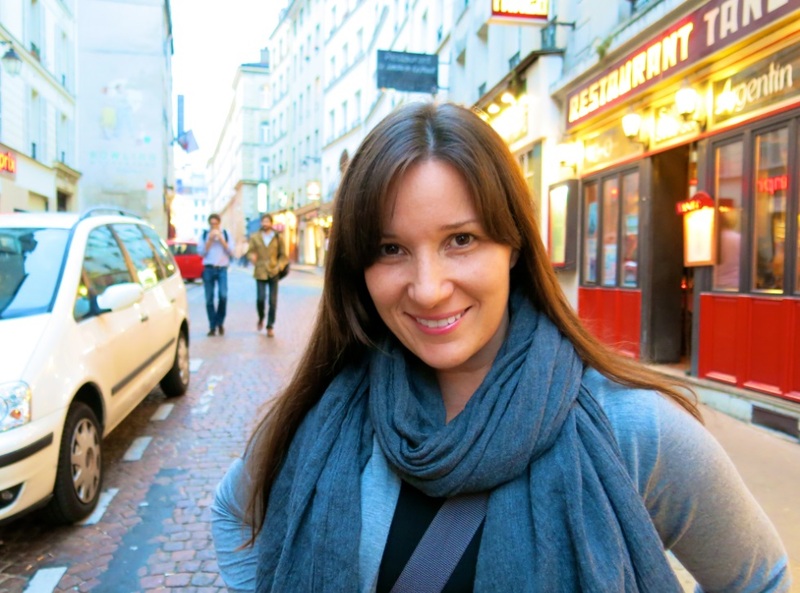 In the book she shares how she went from being a busy and worn out copywriter to simplifying her life and becoming an artist in Paris, finding unexpected love on the way. 1. Did you ever imagine when you first went to Paris that you would end up living there? Not in a million years. I thought I’d like to live in Rome. When I first planned my European itinerary, I made Rome my final stop so I could either stay there and eat pasta every day or figure out where to go from there. But of course, by then I had met the lovely Christophe in Paris who had asked me to return. Since I gave up my job and my apartment in California, I figured, hey why not? Paris is hardly outer Mongolia. I’d go and see about this Christophe fella. And of course, I fell in love with the city around the same time I fell in love with him. Paris is definitely well suited for me. For an artist, the streets provide constant inspiration. Before Paris: Stressed. Traffic. Alone. After Paris: Inspired. Stroll. Love. 3. You mention in your book that you write three pages in your journal every day, as recommended in Julia Cameron’s book, The Artist’s Way. After doing this for so long, do you ever struggle with what to write or is it one of those things where the more you do it the more you can do it? How helpful is journaling in your life now? I would love to tell you it gets easier, but that third page is still a pain much of the time. Though it has become easier to show up at the page. I can now open my journal and begin quite easily. Journalling has helped me organize my thoughts, my day and my future plans. Being the master of my own business requires a lot of planning. The journal is where I carve out time to plan. It’s also where I dream. It’s also where you’ll find my daily list of things to do. Writing everything down has made me more efficient with my days. 4. Did it cross your mind that you might meet an eligible bachelor while travelling, or was your whirlwind romance totally unexpected? Not only did I not expect romance, I had given up entirely on finding it. Back when I lived in Los Angeles, I really thought the love of my life was there and all I had to do was find him. After many disappointing dates, I gave up looking for him. I was in complete acceptance that it might never happen. In a way, I broke up with my imaginary boyfriend who lived in Los Angeles. I took off for Europe, and of course, there he was waiting for me to arrive. Even when I met Christophe, I didn’t think we would have a relationship. I was traveling through Paris. Knowing I was just passing through and having already given up on romance likely made me more open to simply living in the moment with this handsome butcher. And that likely helped romance blossom. Life is funny that way. 5. At the back of your book you list a ton of helpful ways to declutter, simplify your life, and save or earn money. For people who are overwhelmed with their lives and want to get started on making some changes, what three tasks do you suggest they start with? 1. Oatmeal. The cheap bulk kind. It’s healthy, filling and so very affordable. You can get ahead in a lot of aspects of your life by eating oatmeal in the morning. I don’t cook mine. I toss it in a bowl with some nuts, seeds, cinnamon and whatever milk I have on hand. 2. Live beneath your means. You’ll likely start saving and be able to pay off credit and boost your bank account. Being able to live life with a chunk of change in your pocket provides an air of peace and calm in your life. 3. Write in a journal daily. I came up with so many ideas on how to save money (like saying no to group dinners that left me drained in spirit and pocketbook) and earn money, which led to my Etsy shop that now brings in most of my income. And in between all that, I had my Lists of Things To Do each day, which just made me more efficient in my days, resulting in more energy to clean out my drawers and sell household items online. 6. How did you go about getting your memoir published? Once my romance and artistic life started to blossom in Paris, I realized this might make a memoir that would help and inspire. I consulted Linda Sivertsen over at http://bookmama.com/. She helps people create a book proposal. I researched agents who are great at selling memoirs and found Laura Yorke at the Carol Mann Agency in New York (laura@carolmannagency.com) and sent her a note explaining my book. She agreed to see my book proposal. She signed me right away and we went about pitching the book to publishers. We landed with Sourcebooks and I couldn’t be happier. This publisher is fantastic. Great editors, great publicists, great resources for authors. 7. You created a business selling painted letters from Paris. Do you have a favourite Paris Letter so far? The most recent Paris Letter is always my favorite. I never know exactly how it will turn out. The process is magical, even for the one holding the brush. 8. 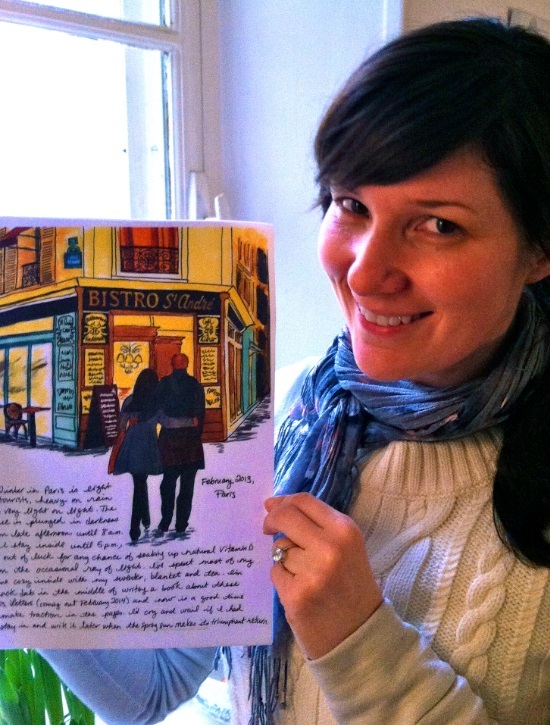 When you’re not writing or painting or enjoying the sights of Paris, what do you like to read? I love reading memoirs, but only happy stories. Tragedy bums me out. I also like historical fiction because it’s a history lesson wrapped in the shiny bow of an entertaining story. Though lately I must admit, more of my free time goes to lounging around Pinterest. It may be the best museum I’ve ever visited. And that’s saying something as one who lives in the City of Museums. 9. My readers love romantic stories with a happy ending (or at least, a happy new beginning! ), what’s next on the horizon for you? I love romantic stories with happy endings, too. The other night I watched The Notebook (again!) but this time with French voiceover. And I bawled my head off (again!). But it was the good kind of crying. So satisfying. Alas, I cannot impress you with my French. My French is not impressive. Thanks for sharing your story, Janice! >> Follow Janice’s ongoing journey at her website/blog. >> To get a copy of Janice’s memoir, PARIS LETTERS, check out your local bookstore or buy via the links on this page HERE. 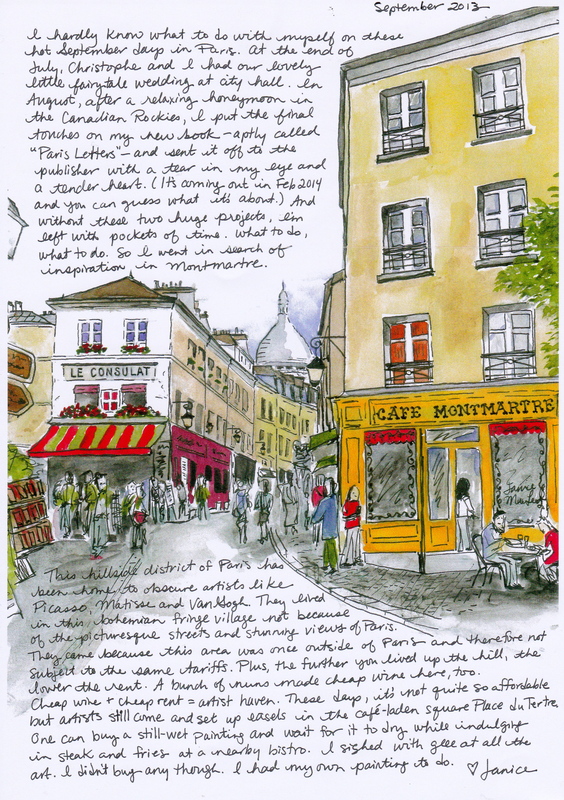 >> And for a little taste of Paris delivered to your letterbox each month, subscribe to her personalised, painted letters HERE. Exhausted and on the verge of burnout, Janice poses this question to herself as she doodles on a notepad at her desk. Surprisingly, the answer isn’t as daunting as she expected. With a little math and a lot of determination, Janice cuts back, saves up and buys herself two years of freedom in Europe. 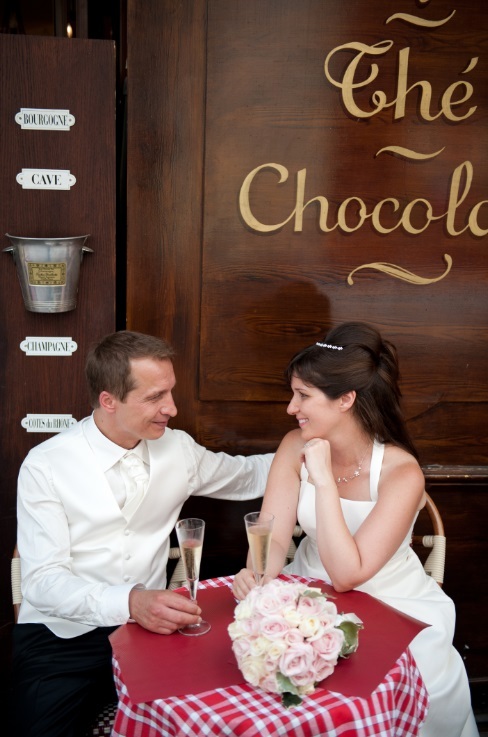 A few days into her stop in Paris, Janice meets Christophe, the cute butcher down the street—who doesn’t speak English. Through a combination of sign language and franglais, they embark on a whirlwind Paris romance. She soon realizes that she can’t ever return to the world of twelve-hour workdays and greasy corporate lingo. But her dwindling savings force her to find a way to fund her dreams again. So Janice turns to her three loves—words, art, and Christophe—to figure out a way to make her happily-ever-after in Paris last forever.